A while back I bought a donut pan, hell-bent on baking up a storm. The only problem is, I’m on a diet – technically. Which means, I can’t really eat all these baked goods that I want to make. So that means I’m either waiting for company to come over, or I’m shoving the sweet treats at my co-workers. But, as luck would have it, my cousin is coming to visit me this weekend. And since I didn’t have anything better to do while I was cleaning the house, I decided, why not bake up a batch of donuts. Perfect for breakfast, right? So I went through my cabinets and oddly enough, I have all the ingredients to make donuts from scratch. Who knew? I even had a can of chocolate frosting, making it way easier than making some. So bring it on! I’ve got donuts awaiting my cousin’s arrival! Preheat oven to 425. In a large bowl, combine dry ingredients. Add milk, eggs, and butter. Stir until well mixed. 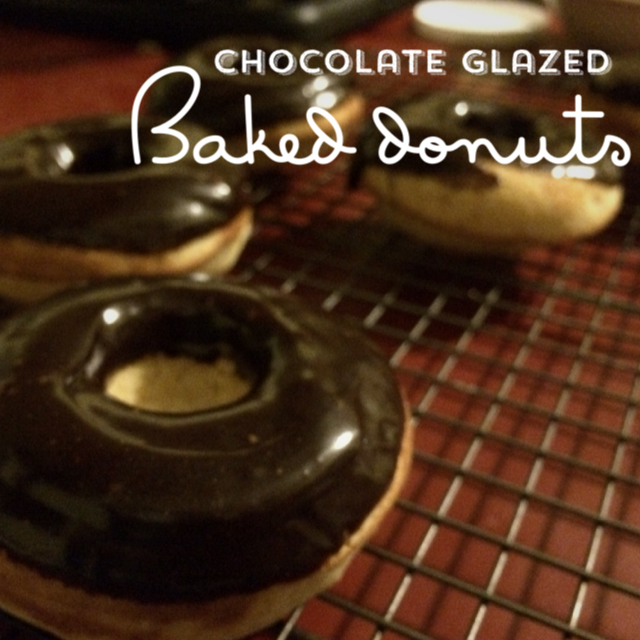 Pour batter into a sprayed donut pan, filling rings about 2/3 full (about 3 tablespoons). Make sure center is not covered. Bake about 8-10 minutes, or until tops spring back when pressed. Remove from oven and let sit in pan for 5 minutes. Heat a half a cup of frosting in a microwave safe bowl for 30 seconds. Frosting should be malleable, but not watery. Dip donuts in frosting, turning in a clockwise fashion to cover the top. Place donuts on cooling rack to rest.